Prevention is the primary focus of In-Spex. 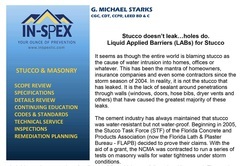 We want to help you prevent water damage, cracking and any other supposed “stucco” problems by aiding you in writing a proper scope, specifications and detailing. I like to describe our program as a 3-legged milk stool; it only stands when all three legs are present. The goal of our program is to prevent envelope issues, as they relate to stucco, with an on-going solution in consideration of all of the legs. 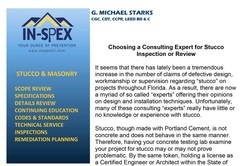 We do this in the form of a “Stucco Manual” that we develop together and includes a thorough review and commentary of your current scope and specifications while working with your design staff to provide base detailing to include in your drawings to guide subs, the inspectors and the project managers. We will also review your scope and specifications for several abutting trades and offer recommendations designed to more clearly define the effects of their actions on each other. This has the intended consequence of reducing weak links in the chain while promoting harmony between trades. Inspection and verification requires attention by the project managers. We will include an inspection check list for both pre-construction plans review and for jobsite verification. Some builders have opted to have 3rd party inspectors on retainer to do either in-house, quality assurance inspections or actual certified inspections in place of the jurisdictional Building Inspectors. In-Spex can offer QA inspections for fee in limited geographical scope or we can provide a list of the better inspection agencies that can offer wider ranging service, at your preference. Lath Over Concrete Block – A Bad Idea? 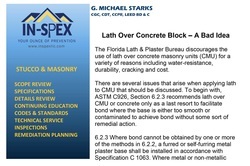 The Florida Lath & Plaster Bureau discourages the use of lath over concrete masonry units (CMU) for a variety of reasons including water-resistance, durability, cracking and cost. 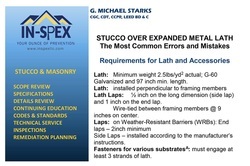 There are several issues that arise when applying lath to CMU that should be discussed. ​Lath: Minimum weight 2.5lbs/yd2 actual; G-60 Galvanized and 97 inch min. length. Lath Laps: ½ inch on the long dimension (side lap) and 1 inch on the end lap.